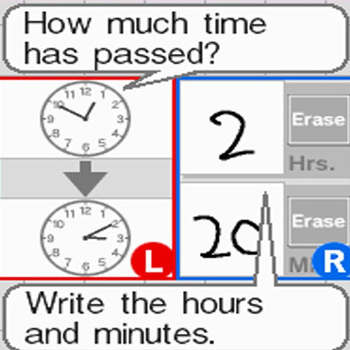 Brain Age: Train Your Brain in Minutes a Day for Nintendo DS is a fun, rewarding form of entertainment everyone can enjoy, as it helps players flex their mental muscles. Brain Age is inspired by the research of Professor Ryuta Kawashima, a prominent Japanese neuroscientist. His studies evaluated the impact of performing certain reading and mathematic exercises to help stimulate the brain. Brain Age presents quick mental activities that help keep your DS brain in shape. Activities include quickly solving simple math problems, counting people going in and out of a house simultaneously, drawing pictures on the Touch Screen, reading classic literature out loud, and more. You can also play sudoku, the number puzzle game which has become an extremely popular feature in newspapers. On your first day of exercise, you will take a series of tests and get a score that determines how old your brain is. This number is called your "DS Brain Age"